There's nothing better than sitting down to a warm bowl of chili on a cold winter day. Especially one that you can feel good about eating! As always, our version doubles up the veggies, uses lean ground chicken and skips all the unneeded calories but packs a powerful flavor punch! 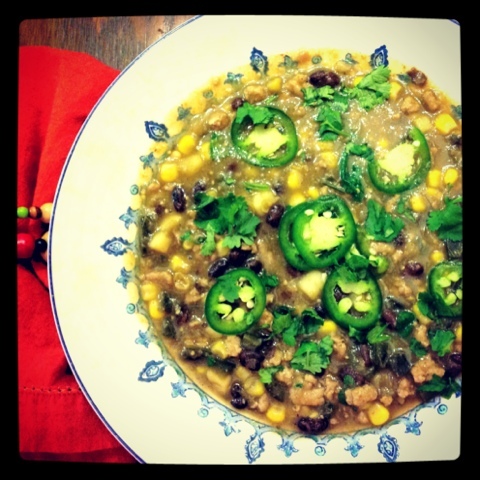 Tonight we're making Green Chicken Chili. We start by browning up lean ground chicken with red onion, garlic and poblano peppers. We season it up with cumin, chili powder and cayenne pepper for added heat. 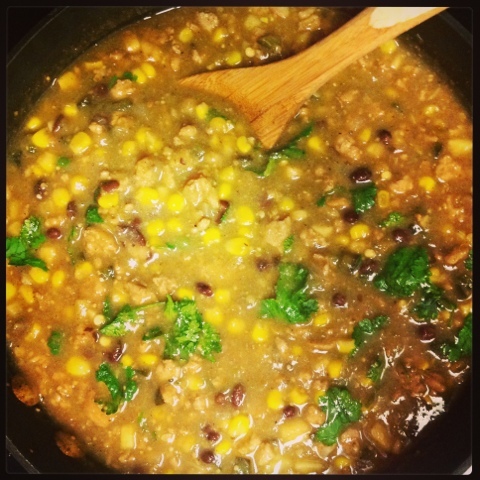 We add in a jar of salsa verde, black beans, corn, chicken stock and let it simmer away. Top it off with cilantro & jalapeños and you have the perfect bowl of spicy chili! And with the Super Bowl less than a week away, everyone seems to be searching for the perfect chili recipe. Serve this dish up on Sunday and all your guests will be so impressed we promise they will have no idea they are even eating healthy! 1. Heat large pan over medium high heat. Brown chicken in 1 tsp of extra virgin olive oil. 2. Add onion, poblano pepper and garlic to pan with chicken and sauté for 5 minutes. 3. Add the salsa verde, chicken stock, cumin, chili powder, cayenne and flour to the dish and bring to a boil. 4. Mix in black beans and corn and reduce heat to low. Let chili cook for at least 30 minutes for flavors to combine but the longer it cooks, the better it will taste! 5. Before serving, stir in half the cilantro. Dish up into serving bowls (will feed 4-6). 7. Top with additional cilantro and sliced jalapeño for garnish!